Shrewsbury – Shrewsbury Youth & Family Services, Inc. (SYFS) is pleased to announce the 2013 Harry S. Cutting, Jr. Award recipient is Robert Paul Jacques. This recognition honors those who embody the spirit of giving, service and support for the Shrewsbury community. SYFS established the award in 1990 to honor one of the agency&apos;s founders and a noted philanthropist in Shrewsbury, Harry S. Cutting Jr. Previous award winners include former state Rep. Karyn Polito, Town Moderator Christopher Mehne, Janet Trippi, Shrewsbury Rotary Club and other distinguished individuals and organizations. Most recently, the Irving J. Donahue family and last year&apos;s Edwin B. (Ted) Coghlin were the award recipients. This year, SYFS is coming full circle. The organization was founded in 1983 and SYFS will celebrate 30 years of caring at its 9th Annual Gala, Saturday, Feb. 9, 2013, at St. John&apos;s High School. Longtime Shrewsbury resident and SYFS board member Michael Gregory will chair this year&apos;s gala. Robert Paul Jacques, or Bob as he prefers, was a member of the inaugural board of directors and an incorporator of the organization. According to SYFS Executive Director Jeffrey Chin, it is fitting to recognize Bob as this year&apos;s recipient, as SYFS marks this milestone. Bob was born July 25, 1945, one of four children born to Louis and Gertrude Jacques.? He was raised in Worcester, graduated from Assumption Prep and College of the Holy Cross. After graduating from Holy Cross, Bob joined the Peace Corps. In the late 1960&apos;s, he served in Malaysia as a rural health facilitator. Bob went to work for the State Department of Public Health upon his return to Massachusetts. In 1973, he accepted the position of director of Public Health in Shrewsbury and held that post for 16 years. He was president of the Mass Health Officers Association and of the Mass Environmental Health Association. Bob was a driving force in gaining recognition for these agencies and for their roles in protecting public health and the environment. He served as a mentor to many members of the organizations. He also served on the Environmental Policy Committee at the Mass Municipal Association and on the Department of Environmental Protection&apos;s Solid Waste Advisory Committee. Bob represented Shrewsbury on the Central Mass Resource Recovery Committee. Bob was responsible for the operation of the Shrewsbury municipal waste landfill. Today this landfill continues to be one of the largest sources of revenue for the town and a key component of the operation of the Wheelabrator Millbury facility. In 1989 Bob left his post in Shrewsbury and went to work for Wheelabrator as the manager of business development for New England. In this role, he sought to develop solid waste management facilities relying on mutually beneficial public-private partnerships based on the model used during his tenure with the town. Wheelabrator and Bob&apos;s philosophy of community commitment is expressed by supporting SYFS, Shrewsbury educational programs and other local causes. Bob is particularly proud of Wheelabrator&apos;s partnership with Robert Terkanian of Hair Lines Inc. of Shrewsbury who, together, have donated the new signage seen at many of the town&apos;s public schools and facilities. Examples of Bob&apos;s sense of community through Wheelabrator include the stocking of fish annually at Jordon Pond, funding the landscaping of the Shrewsbury Senior Center, sponsoring new lighting in the downtown area of Shrewsbury, as well as supporting local community groups such as SYFS and the Spirit of Shrewsbury. Bob has been married to Francine for 42 years. They are the parents of two sons, Robert and Daniel, who were educated in Shrewsbury and are now both engineers. He welcomed his first grandchild, Madeleine, in 2011. Bob is newly retired and plans to play golf, travel and enjoy his grandchild. 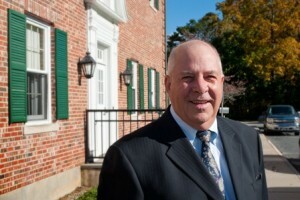 Bob continues to serve the town as chair of the Shrewsbury Conservation Commission. Anyone interested in sponsorship or volunteer opportunities for the gala can contact SYFS at 508-845-6932 or visit www.syfs-ma.org. The event takes place Saturday, Feb. 9, 2013, in The Salem Commons, Saint John&apos;s High School in Shrewsbury. The evening is a celebration of community spirit and a fundraiser to support critical SYFS programs for local children and families. Tickets are $85 (a portion of which is tax-deductible) and can be purchased over the phone 508- 845-6932 with a credit card, or at SYFS, 240 Maple Ave., Shrewsbury, with cash, check, or credit card. Space is limited. Shrewsbury Youth & Family Services Inc.